The Southeast Asian nation is relying heavily on dams to meet domestic and regional demand for energy. Lao People’s Democratic Republic (Lao PDR) is not exactly a heavy hitter in Southeast Asian energy production. Each year, the country produces approximately 8.2 billion kWh of electricity, less than one-tenth the generation capacity enjoyed by Vietnam and other neighbors. Among the member states of the Association of Southeast Asian Nations (ASEAN), only Cambodia and Brunei Darussalam produce less energy. But this country of 6.77 million is nonetheless taking on strategic importance as an energy exporter to its neighbors. Under the ASEAN Power Grid (APG) project, construction of a 500 kV transmission line between Nan Mang 3 substation in Lao PDR and Mae Moh 3 substation in Thailand is expected to reach completion by the end of 2015. The Laotian lignite-fired power plant at Hongsa, which is expected to produce 1,878 MW and is also slated for completion by the end of the year, will then use this transmission line to export roughly 80 percent of its electricity generation to the Thai market. Two other transmission lines between Lao PDR and Thailand are expected to be completed in 2018-2019, while the line between Udon Thani 3 and Nabong will have its capacity doubled to 500 kV by the end of 2019. Energy-strapped Cambodia will also soon benefit from Laotian hydroelectric power: A 115 kV transmission line to Cambodia’s Stung Treng province is anticipated by the end of 2016. Development of Lao-Vietnam infrastructure is also underway with a view to completion by 2020, although it is unclear which way the electricity will flow on those transmission lines. Vietnam uses a total of 98.7 billion kWh of electricity each year, but that still leaves it with an annual surplus of almost 30 billion kWh. The Vietnamese government expects to generate a further 7,100 MW via nuclear power by 2030 with technical assistance from the Russian Federation and partial financing from Japan. It remains to be seen whether Lao PDR can keep with regional demand, however. Currently, the country benefits from relatively domestic consumption. Only 10.4 billion kWh of energy is used domestically each year, including fuel for the transportation sector. But domestic consumption is expected to increase almost sevenfold in the next 20 years as the Laotian authorities struggle to move beyond mining, rice farming, and garments to develop a strong manufacturing base. 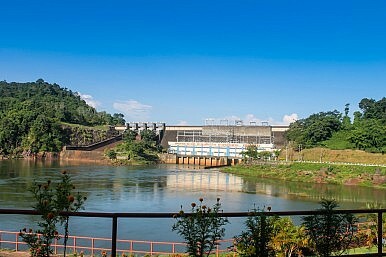 Lao PDR is attempting to meet that demand almost exclusively through boosting its hydroelectric power generation, planning to build 93 more dams by 2020 with financing from China. But this damming of the Mekong River has many worried that fish migration will be disrupted. Famers in Cambodia and Vietnam also depend heavily on sediments from the Mekong as fertilizer. Therein lies the conflict of Southeast Asian economic development. Member states of the Mekong River Commission – Cambodia, Laos, Thailand, and Vietnam – need cheap, reliable electricity from Laos to power communities in their developing regions, but they also need the unrestricted flow of the Mekong’s waters. One possible solution would be for Lao PDR to harness more of its renewable energy potential; a consortium of international companies led by Hydrochina is currently conducting a feasibility study on solar and wind energy in Laos. But the Laotian government is not providing the required leadership in this area; the Renewable Energy Strategy adopted in 2010 by Lao PDR’s Ministry of Energy and Mines calls for renewable energy sources to satisfy 30 percent of domestic energy consumption by 2025, yet no major renewable energy projects have been announced to date. Biogas and residential solar energy projects initiated by the private sector will not come close to meeting the targets set out in the 2010 strategy. As such, the prospects for green growth in the Laotian economy appear rather grim as of this writing. Lao PDR will continue to dam waters otherwise destined to reach Cambodian farm fields in order to send cheap electricity to Phnom Penh, accelerating both the urbanization of Southeast Asia and its resource shortfalls. Paul Pryce is the Political Advisor to the Consul General of Japan in Calgary and writes on security and energy issues for such institutions as the Atlantic Council of Canada and the Centre for International Maritime Security. While the region can’t give up on coal for now, there is a lot it can do to get clean.